Thick, rich, creamy, hmmmmm, deliciousness! That's because Dannon® Oikos® is created through an authentic Greek straining process which gives it a rich and creamy-thick texture. It makes my tongue dance. Yes, my tongue can dance. And as someone who eats a lot of yogurt, I can tell you that Dannon Oikos is delicious. For the record, I've always bought Dannon yogurt for my family. So I was thrilled to get to try out the new Oikos Greek yogurt. I always make healthy snacks available for my family, and I've added Dannon Oikos to my staples. Dannon® Oikos® Plain and Fruit on the Bottom contains 0% fat, while the Dannon® Oikos® traditional blended varieties contains about 3% fat. Both are an excellent source of protein, twice that of most regular lowfat yogurts. My son loves the Fruit on the Bottom; which makes me happy since he isn't a big meat eater… nice knowing he can get the needed protein. And for breafast before school this morning, he asked for the Dannon Oikos Fruit On The Bottom – Blueberry. I personally like the plain yogurt (I usually add a little granola to it). The thing I so enjoy about the Dannon Oikos Greek Plain yogurt, is how thick and creamy it is… you really don't need to add anything to it. 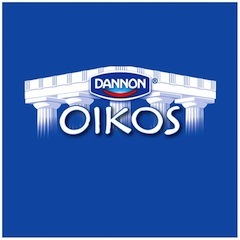 If you've not tried the new Dannon Oikos Greek Yogurt yet, you really should. It's that good! OMG… I love the Oikos Greek Yogurt, Yummy!